Article 1 Section 10 of the U.S. Constitution prohibits states or their subdivisions from entering into any "treaty, alliance or confederation" with a foreign political organization. Contracts with ICLEI – Local Governments for Sustainability headquartered in Bonn, Germany fit into this prohibition. Increasingly, American citizens are becoming aware of this fact. By Michael Shaw, 1/3/2010 - America is in the final stages of the political economic changes necessary to secure the age old thrust for a central global dominion. The transformation we are experiencing is designed to negate the political recognition of your right to life, liberty and the use and enjoyment of private property. We did not get into this mess overnight and it won’t be easy to get out. But get out we must. Have we abandoned the uniquely American concept of the political, legal and educational recognition of unalienable rights? Reaffirming unalienable rights is our call to duty. 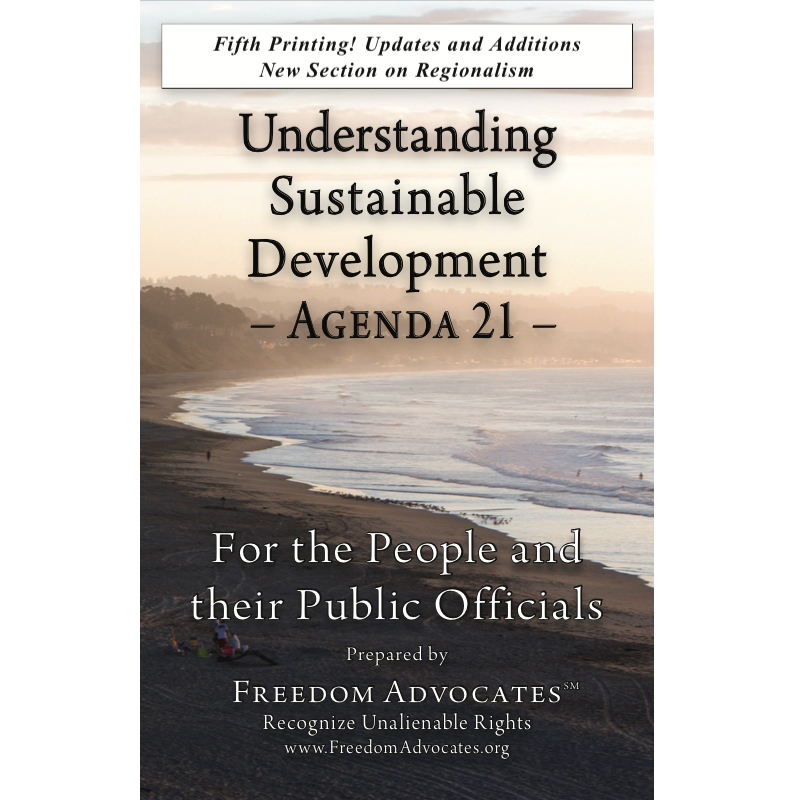 You can contribute to this accomplishment by defending unalienable rights and by understanding and informing others of our government’s unrelenting commitment to the ‘global to local’ program of Agenda 21 Sustainable Development. The concepts of freedom and democracy conflict so regularly that Plato pronounced, "Democracy leads to anarchy, which is mob rule." Freedom is the ability to decide and act for one’s self. Democracy requires all people to conform their action to the rule of the majority. Why do we use the term unalienable instead of inalienable? Inalienable rights are subject to changes in the law such as when property rights are given a back seat to emerging environmental law or free speech rights give way to political correctness. Whereas under the original doctrine of unalienable rights, these rights cannot be abridged. By Genevieve LaGreca, 6/23/2009 - I love America for being the place where an upstart group of colonists, against all odds, battled the most powerful empire in the world—and won—all in the cause of liberty. I love America for establishing a revolutionary new country in which a person’s life is his and his alone to live for his own sake, and government’s sole purpose is to protect that sacred right. By Genevieve LaGreca, 12/3/2008 - America today is a nation in trouble. The great fortress of liberty, the country of the most productive, prosperous, and happy people in the world is in grave danger. America is under siege by the Dark Side, the forces of statism, while its Knights of Liberty are disarmed, demoralized, and suffering near-fatal wounds. The country that once elected leaders whose ideas upheld liberty now elects leaders whose sweet-sounding platitudes and woozy promises are all that is required; and whose actual, dangerous ideas need not be examined until after Election Day. By Clyde Cleveland, 11/7/2008 - At the end of 1776 Thomas Paine wrote a series of articles entitled "American Crisis." This series played a critical role in saving the Revolutionary war against the British. Most of the British officers returned home for the winter thinking that the war was over. It was a very bleak time for the colonial army after their humiliating loss in New York. Most of the troops went home for the winter, and those that stayed were freezing and starving. Many defected to the British. Paine's first letter in the American Crisis series shifted the public awareness, and troops enlisted and people donated essential materials. Paine’s articles made a major impact. By Marilyn Taylor, 10/2/2008 - Finally—after the long, hot summer without communiqué, the tension broke as the delegates emerged to publicize the fruition of their exhausting deliberation. A lady approached one of the delegates. “What kind of a country have you given us, Mr. Franklin?” she asked. September 5, 2008 marked the 338th anniversary of when jurors refused to convict William Penn of violating England's Conventicle Acts, despite clear evidence that he acted illegally by preaching a Quaker sermon. In refusing to convict Penn, the jurors ignored what they knew to be an unjust law. This is known as jury nullification.